Have you got a new Android device? Like Samsung Galaxt Note 4, Galaxy Tab Pro, Kindle Fire HDX 6, Nexus 9, Sony Xperia Z tablet, Moto X, etc. Do you want to transfer Blu-ray Digital Copy movies to your Android tablet for watching freely? Nowadays, many Blu-ray discs you purchased come with an additional Disc – Digital Copy, which provides you with a digital version of the movie. Your disc provides you with the highest quality home entertainment experience available today and your Digital Copy gives you the flexibility to watch your movie anytime, anywhere. Sounds great, doesn’t it? Well… no. When you’re trying to play Digital Copy movies from Blu-ray on an Android-based Tablet or phone like Galaxy Note 4, Note 2, Galaxy Tab Pro, Galaxy Note Pro, Google Nexus 9, new Nexus 7, Kindle Fire HDX 9, Kindle Fire HD, Sony Xperia Z, Moto, Nook HD, Transformer Infinity TF700 and so on, you will find playback is a blue moon. This is simply the movie industry’s latest attempt to sugar coat Digital Rights Management(DRM). The Digital Copy, however, will not play on unauthorized devices due to DRM (Digital Rights Management) copy protection. Unfortunately the Android devices have not get a license to play DRM contents, which means Digital Copy movies will not even play on an Android tablet. It is a pleasure that 20th Century Fox is aiming to change all that and will be bringing digital copy downloads to Android but I didn’t hear much about it. In order to transfer Digital Copy movies to an Android-based device for watching, you’ll need to strip DRM from Digital Copies and then convert/record Digital Copy movies to Android supported video formats (MP4 with H.264 video codec is highly recommended). To get the work done, a Digital Copy Video Converter is needed. There are many programs out there that allow you to make Digital Copy movies out of DRM restriction and lets you watch them the way you want to view them. 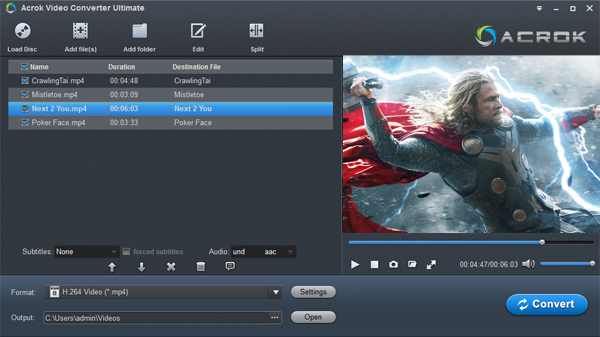 The combination of Acrok Media Converter, a ase-to-use and top DRM removal software, can easily help you make free digital copy out of DRM-protected contents to fit your Android-based Tablet and smartphone. Besides Digital Copy, you can also remove DRM protection from downloaded or purchased contents from iTunes, Amazon, BBC iPlayer, Blockbuster, Blu-ray/DVD Digital Copies, wbdigitalcopy, etc. Meanwhile the playback of the recorded movies is as decent as possible as original. Below I would throw a quick tutorial up on how to strip DRM and convert/record Digital Copy to Android friendly file type with Acrok Media Converter. Just download the Windows version and follow the step-by-step guide below to learn how to transfer and play Blu-ray Digital Copy movies on your Android tablet. Note: Before conversion you need first to transfer Digital Copy to computer in Windows Media (.wmv) or iTunes video format (.m4v). And here we go with the DRM removal process. Step 1: Assuming you have downloaded the Digital Copy Converter for Android to your PC, the first step is to drag and drop digital copy movie to the software. Step 2: Select an Android friendly format, e.g. H.264 .mp4 for conversion. There are optimized video format for Nook HD tablet, Kindle Fire HD, Galaxy Tab 3, Galaxy Tab 2, Galaxy Note 3. Galaxy Note 2, Google Nexus 10, new Nexus 7, Kindle Fire HDX, Kindle Fire HD, Moto X, Sony Xperia Z1, Asus Transformer Prime/Infinity TF700, Acer Iconia Tab etc. Basically the Common Video -> H.264 Video (*.mp4) is an universal format for Android tablets and smartphones. If you like, you can click “Settings” to change the video encoder, resolution, frame rate, etc. as you wish. According to my experience, the file size and video quality is based more on bitrate than resolution which means bitrate higher results in big file size, and lower visible quality loss, and vice versa. Normally, we can choose 720p (1280*720) as output resolution for Android tablet. Step 3: Click the big “Convert” button to remove DRM and record Digital Copy movies to Android tablet for watching. Step 4: Transfer Digital Copy to Android tablet. When the Blu-ray Digital Copy to Android conversion is done, you can click open folder button to get the recorded movie files. Connect your Android device to computer. Transfer Digital Copy to Android tablet via USB cable. So there you have it. Pretty simple. Along with some help from the excellent DRM Removal Converter, you can effortlessly bring Blu-ray downloads to your Android tablet for watching anytime, anywhere. Have Fun!